3 way electrical ball valve with 1 inch female threads (BSP) and energy efficient 230V AC actuator with integrated relay. Suitable for liquids and gases (max 110°C) and a pressure from 0-10 bar. Suitable as zone valve in heating systems. The valve has a brass housing with chromed ball and PTFE valve seats. The nominal diameter is 18mm, the Kv value is 16m3/h (266.7 l/min at dP=1 bar, water). 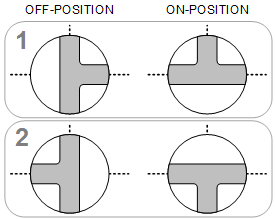 3-wire connection (open-close): phase, neutral and control wire (phase). The valve opens in 16s (normally closed). Very energy efficient and robust 3 way JP Fluid Control electric ball valve to open or close pipes electrically. The valve has 1 inch threads (female thread BSPP) and a 230V AC actuator (IP54). This valve is suitable for liquids and gases (-10 to 110°C) and is often used in heating systems. A ball valve is less sensitive to dirt than a solenoid valve. It is however recommended to install a filter before the valve. The valve body is made of brass, the ball is chrome plated and the seal is PTFE (Teflon). The orifice is 18 mm, the Kv-value is 16 (266.7 l/min at dP=1 bar). The time for opening or closing is approximately 16 seconds. The 3-way valves can be connected in two different ways as shown in the schematic below.